Martin Luther King, Jr. Rosa Parks. Jackie Robinson. Dean Smith. 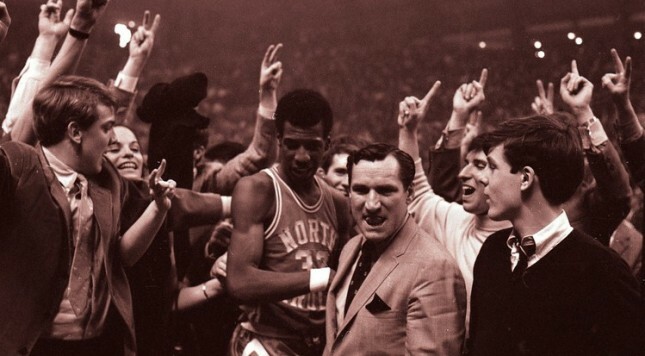 While leading on the court, Dean Smith took an even more impactful leadership role in life as a civil rights leader in a newly desegregated South in the 1960s. Many know that Smith brought in the ACC’s first African-American player in Charlie Scott. What is most remarkable are the stories that are being shared about Smith for his work in race relations and his unwavering love for humankind, regardless of skin color. Even before taking the head coaching job at North Carolina, Smith worked to force a popular local restaurant to allow African-Americans to dine there. So disappointed to hear that segregation was still going on, Smith had to set this right. The Pines, an eatery which was popular with many athletes, was where Smith invited a black student and a reverend (who was black) to enjoy a meal with him. The restaurant was not able to turn the group away — Coach Smith was part of the group. This lead to the restaurant being open to everyone. Smith worked for civil rights even prior to becoming a coach. As a high school player in Topeka, Kansas, Smith worked to integrate a pair of teams from the same school — a white team and a black team – into one. Smith went to the principal at Topeka High School in an effort to join the two teams together. After Smith had graduated and moved on to Kansas University, the pressure was still applied, and the teams became integrated. One of the members of the former segregated black team was Oliver Brown… yes, that Brown from the Brown v. Board of Education case that transformed the country. It should also be noted that Smith made this bold move five years before the Brown decision came down… in the same city. This came from an upbringing in which Smith was taught by his parents to treat everyone with dignity, regardless of their appearance. Smith’s father even put a black player on his roster in the 1930s, well before the civil rights movement. While Smith admitted that racial issues were not a hot topic in the household, this respect built the man who truly changed the world. It seemed that Smith owned a deft touch in civil rights and race relations issues everywhere he went. He broke down walls left and right. Smith was vital in allowing an African-American student to purchase a home in a previously all-white neighborhood during his time at North Carolina. The student, Howard Lee, would later become the town’s mayor. Along with recruiting the aforementioned Charlie Scott to North Carolina, the typically calm Smith always defended his player against the slurs that would come from a South that was not always ready for this change. One story recalls a night in South Carolina, when Smith was going to attack a fan for calling Scott a “black baboon.” Smith was ready to head into the crowd after this fan, and had to be restrained by his staff. One quote I found perfectly summed up Smith and his efforts. Smith never did what was easy and socially accepted; he always did what was right. While it is hard to forget Dean Smith the coach, this weekend the world lost Dean Smith the man. Thankfully, he will live on with all he touched, and the character he built and shared. Sports had always been a place where racism ran rampant during the civil rights era. Smith worked every day to alter this stigma. Dean Smith changed the world and made it a better place for all who live in it.